The except below is from Grist’s popular “Ask Umbra” feature. One rain barrel hazard that Umbra leaves out is getting the Rain Barrel Song in your head. Once there, it can stay for days. Umbra’s comments illustrate that owning and using even the simplest of objects can be really complicated.–Hardly Waite. Once it hits your roof, a raindrop may run over and collect a number of contaminants. Everything from roof-treatment chemicals to airborne heavy-metal pollutants to mold to the poop from roosting birds or squirrels may be swept into your clean-looking barrel. So while using the water to irrigate trees, shrubs, and flowers is universally smiled upon, some people get a little queasy about putting it on plants they’ll eventually be eating. Might those rooftop nasties make you sick? I hate to rain on your parade, but there’s not a lot of research out there to provide a definitive answer. One 2013 study from Rutgers examined rain-barrel water for lead, zinc, polycyclic aromatic hydrocarbons (PAHs), and E. coli bacteria. The water harbored no PAHs and little heavy metals, and most (but not all) samples were also low in bacteria. It is possible to have your runoff tested for contaminants at a local health department or well-water testing facility – but experts at Rutgers say testing thoroughly enough for meaningful results is likely impractical and expensive for home gardens. What we’re left with then . . . is your personal tolerance for risk. 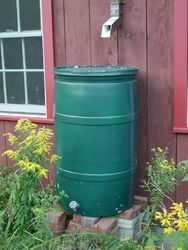 I can tell you that plenty of gardeners do dip into the rain barrel to water their veggies. Experts can tell you the risk is minimal, but the practice is not entirely without peril. You should definitely skip it if your roof is copper or has been treated with chromated copper arsenate or zinc (used to prevent algal growth). If not, though, you must decide for yourself. Feeling lucky? It’s smart to take some precautions. Water the veggies and herbs with a drip or trickle irrigator rather than pouring on the plants themselves; this minimizes direct contact and harnesses the filtration power of the soil. Water in the morning to allow for drying and UV light disinfection, and don’t use rainwater close to harvest time. Always, always wash your veggies thoroughly with potable water before you eat them. You might also consider installing a “first flush” feature that diverts the first few gallons from any rain into a separate barrel, as these are the most likely to contain troublesome additives (though other research casts doubts on this system’s efficacy, too). And finally, make sure to keep your barrel clean throughout the season. Feeling not so lucky? That’s OK too – you can find loads of other uses for that water. Use it to wash your car, top off the pool, clean your gardening tools, and flush your toilet. And as I mentioned up top, rainwater is A-OK to use on non-edible plants. In fact, it’s even better than tap water because it doesn’t contain chlorine or calcium, which may harm beneficial bugs in the soil.